Quilting and Life in General: Oh No! I broke my toe!! Oh No! I broke my toe!! Remember me telling you about stubbing my toe HARD last weekend? I heard a weird little noise when I did it and said to myself, "Don't panic - that was your sandal." It wasn't my sandal. ICK! I've never broken anything before and there's something in the movement of the part that makes you queasy!! CY a good friend who suffered a broken toe last year came over with the right tape (3M Transpore) and showed me how to tape it. But it's been a disheartening week! Getting old - hard to ignore when you're hurting. And trust me, when you're babying a certain part of your body ... everything else hurts! People said, well, at least you can stay home and work on your 'little projects' LOL! Well, you are supposed to keep the affected area above your heart. Hmmm, not even going to try to run the sewing machine in that position!! LOL! Don't tell my husband, but I'm still Nebraskan in my heart - and I miss the clear skies. The Coastal Marine layer can sure grey things out, even when it's not raining - and the layer is flat! Not fluffy clouds racing across a blue sky. In Nebraska I can remember going to the grocery store at sunset, pre-cell-phone cameras, and just sat and looked at a Cecil B DeMille worthy sunset over Holmes Lake. Yes, dinner was a little later because of sitting and enjoying that - but I can still see it. I remember the sun sparkling endlessly off the snow - best enjoyed from inside the warm house, looking out, of course! I remember driving west at sunset and and watching the sun 'bounce' as I went up and down small hills! There - it's down, nope, there it is again! And of course, the people. Definitely people with the best hearts!! Although I couldn't go to the pool (tape in the water is a no-no) or TaiChi (I couldn't see all the twisting and balancing) I did get out to the other activities this week - presented the idea of having a QOV presentation at the quilt show for the Vietnam Veterans meeting. There were a lot of people at that meeting! Looked like a BIG crowd through the nerves. But it went well. I haven't heard back yet, but hoping for their support. It went well enough that I'm presenting to the Marine Auxiliary today. And our first "Mod Squad" was a success! We had 9 participants (2 came in with reservations but we won them over!!) We did an exercise from the book - looking at a photo or magazine picture and studying the lines, colors, the shapes and the composition. 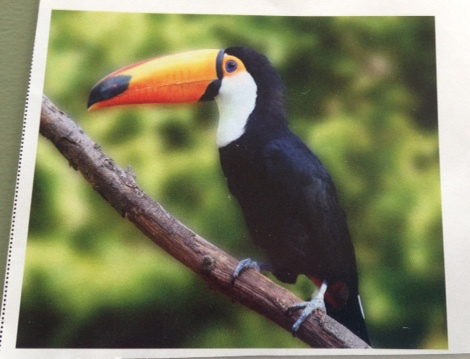 I got the magazine ad of a Toucan. I found that I look at colors as a whole. And I saw his beak as 'orange' but there was yellow, pink and gradations in it. Likewise, I didn't catch the greys shadowing his white chest. But I did notice his feet were blue! Shapes included triangle beak, round eye, diagonal line branch, half circles body .. Patterns - there are vertical lines in his bill as well as the horizontal opening. There's wood grain in the branch. And the background was mottled - great for stippling! Descriptions included: sun-dappled, speckled, opposites, spotted and 'birdy'! Everyone shared their exercise and since our homework is just a 15" square composition - most, if not all, are going to go for it. I told them to look at it as an opportunity to try out new ideas. If they don't work ... you can throw away a 15" square without guilt!! I'll let you know how many blocks come to the next meeting to be gently critiqued! Three day weekend here - hard to tell when you're retired!! But hope to get the jungle baby quilt finished. Just have the borders left to quilt; and then que up the 'beach balls' baby quilt to machine quilt too. Those quilts need to be handed in a week from Monday. And Finishing School (March 5) is headed toward me with the speed of light! So I need to get those 9 presents done. I always swear I am NOT going to wait until the last minute ... but every year it's a race to the finish! We got 4 of the 6 QOV quilts back from the long-arm volunteers and I have 3 more handed in to be sent out. We're hoping for 15 this year - double last years! And since we're arranging a Presentation I'm toying with the idea of making one more - just in case anyone backs out. I'm pretty much counting on ALL 15!! But time is the problem, as always! OUCH on your Toe! I know all about interrupted Plans :/ QOV Presentation sounds like great idea at the Quilt Show. I'm anxious for the SUN as well. PNW is Gloomy right now. Well, that week didn't go as planned! Can anything "TOP" a great Retreat? ?